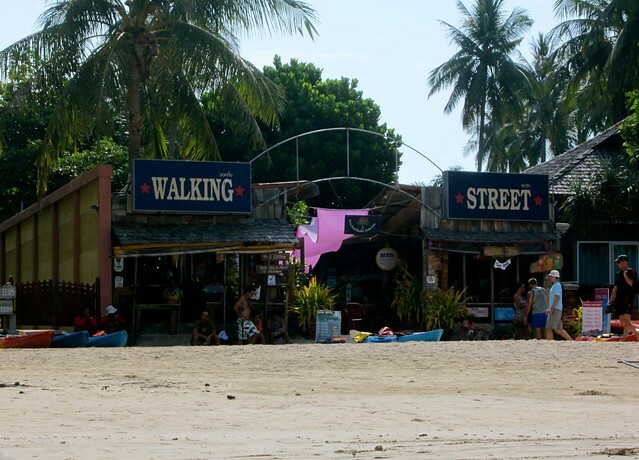 A walking street, how nice to label where the tourists are supposed to walk (can you catch my sarcasm.) The west side of the island is beautiful, but you are paying for the beauty. The restaurants and hotels on this side of the island are much more expensive as well as a constant stream of tourists all day unloading off the longtails. I found the east side quieter yet still full of people and activity. The walk to the west side of the island from Anyavee is only 5 – 7 minutes. We arrived early at Anyavee Resort, were greeted by the front desk and they offered to hold our bags while we grabbed a quick bite to eat and waited for our room to be ready. 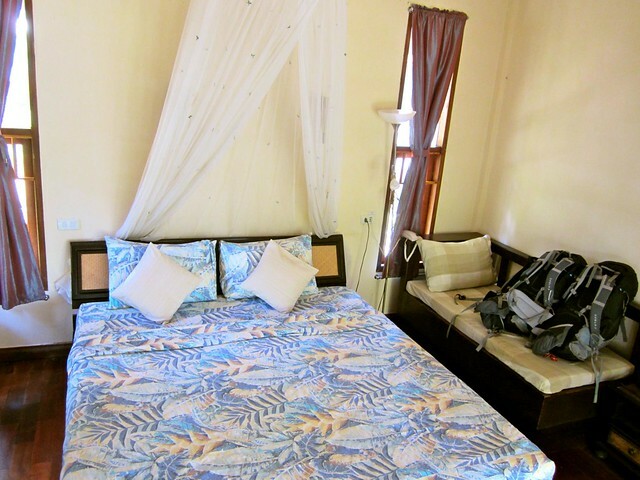 The room was a beautiful wooden bungalow with a lock box, refrigerator (with 2 complimentary water bottles, restocked daily), a big bathroom with a hot shower and a TV – if you opt to watch the television while you are on one of the most beautiful beaches in Thailand! Breakfast in the morning was an event to look forward to. 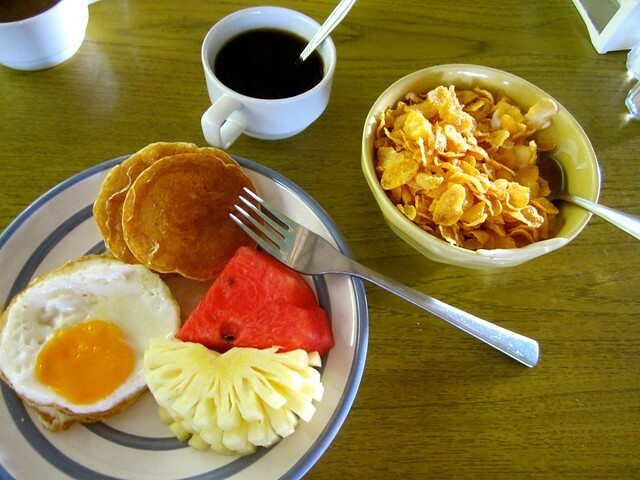 A full breakfast buffet of pancakes, fried eggs, bacon, homemade yogurt and fresh fruit, as well as a more traditional thai breakfast of noodles and veggies. Of course we always started our morning with coffee and fruit juice to get our sugary caffeine kick. Wi-Fi is always one of our most important amenities we look for since we tend to use the Internet more than most. Anyavee doesn’t have wi-fi in the room but you can purchase a card (2 baht per minute) and use the computers near the front desk. Josh and I found less of a need to turn our computers on for the few days we were here and typically ate lunch at a nearby restaurant with free wi-fi so we could check our mail or blog. While on Railay we found ourselves swimming in the ocean much more than we typically do, the water was warm and a beautiful shade of blue. After we spent all day at the beach, Josh and I would return to Anyavee’s pool and relax in the calm of the resort. We talk a lot about amenities that are important to us while we travel and this resort offered two of our favorites, a fridge and complimentary water. We both drink a lot of water on a regular basis, add 90 degree heat and walking around all day and we were often thirsty. Coming back in the afternoon to two cold waters was a delight. 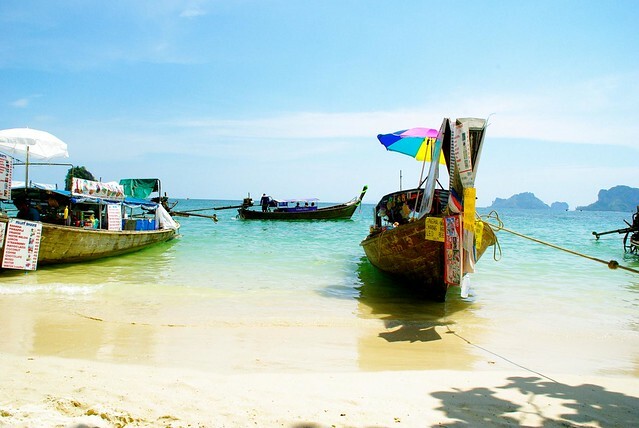 The beach that we would recommend going to is called Phra Nang, a 10 minute walk from Anyavee. Turn right once you leave the resort and follow the east side around. You will see a lot of rock climbing along the steep cliffs you pass, Railay is known for it’s rock climbing and if you are feeling adventurous the view point is a great place to test out your climbing skills. On your next trip to Railay don’t avoid the east side because of what you read or hear! The mangroves are lovely and there are many more options for accommodation and food. We would recommend Anyavee Resort to anyone coming to Railay and hope to return ourselves on our next trip through Thailand. Read about Anyavee Railay Resort and Anyavees other hotels on Anyavees blog about Thailand. More photos of Railay and around Anyavee Resort can be found on our Flickr Set.